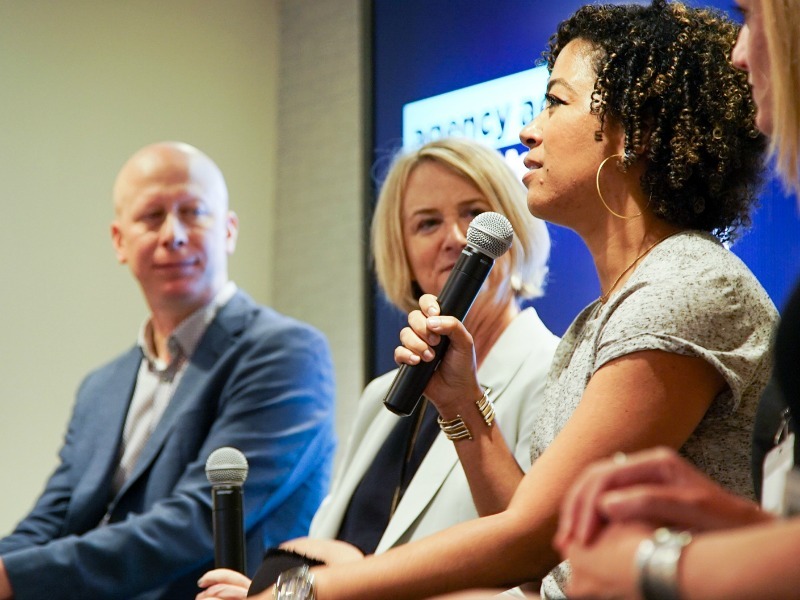 At a Golin-sponsored forum in New York, women and men in marketing discussed the negative impact gender inequity has on the industry, and what it will take for the business to be as diverse and inclusive as it should be. NEW YORK — When the Harvey Weinstein story broke last October, opening the floodgates to untold accounts of sexual harassment, Golin chief creative officer Caroline Dettman took stock of her own experiences over the years working in agencies. The incidents started early on for Dettman, who experienced one of her first untoward interactions at work at 23, when a client threatened to pull his business if she didn’t sleep with him. Then came being touched without consent, and being followed to a hotel room. She was deemed "too strong" for a particular pitch. But, leading a forum Tuesday in New York on sexual harassment and gender inequality in marketing and creative industries (and what women and men can do to about it), Dettman said she doesn’t share those stories to elicit pity or play on emotions. Quite the opposite, in fact. “If anyone thinks this is a victim’s story, it’s not,” said Dettman, the force behind Golin’s “Have Her Back” campaign, which aims to rally the industry to increase the number of female creative directors by driving awareness of the issue, and rectifying it through hiring, training and creating cultures of empowerment. The 3% Movement, SheSays and EvolveHer, all professional women’s organizations, are partnering with Golin on the effort. “This is less about a hashtag, but about a hustle. We need to move from anger to action,"she said. That call to action by Dettman (who acknowledged not making a significant female hire during her first four years at Golin) laid the groundwork for the afternoon discussion that ensued about the myriad topics that fall under the header of due representation of women in the workplace — and why marketing industries are lagging. Participants included Interpublic Group CEO Michael Roth, Golin vice chair Ellen Ryan Mardiks and chief diversity and inclusion officer Margenett Moore-Roberts and leaders of IPG ad agencies like Campbell Ewald and R/GA, all of whom touched on the range of pertinent topics — recruitment and retention of women, challenges facing women of color, men’s role in rectifying the situation and how having a truly diverse and inclusive staff boosts business among them. The industry, however, has a lot of work to do before achieving that, he said. “When you see the statistics regarding women, it’s embarrassing,” he said. “When you look at statistics regarding people of color, it’s disgusting. “The talent that is out there going unutilized is mind boggling,” Roth said. Panelists citied a range of contributing factors, from general acceptance of subtle, more implicit biases to men who may want to step up to the plate not knowing how to do so — or being invited in, panelists said. In some cases, it’s women who contribute to furthering the status quo by, say, playing along with inappropriate behaviors or language to be accepted as one of the guys, speakers said, adding that owning up to the issues is part of remedying them. Part of that, she said, includes building a “culture of empowerment” at Golin, which includes establishing what constitutes unacceptable behavior — such as actions that are clueless, creepy and criminal, she said. Yet strides can be made. Despite the impediments to reaching hiring goals — including women leaving or shying away from agencies — Golin has shown since launching the “Have Her Back” initiative that progress is possible. In June, the agency brought on two female creative directors, Mary Beth Adduci and Karin Rose, bringing to five the number of women creatives Golin Chicago has hired this year, more than tripling their number. Mardiks said that while “there is no explanation” for why it took so long for these issues to come to light — and for women to press for change — the industry “just must move forward now.